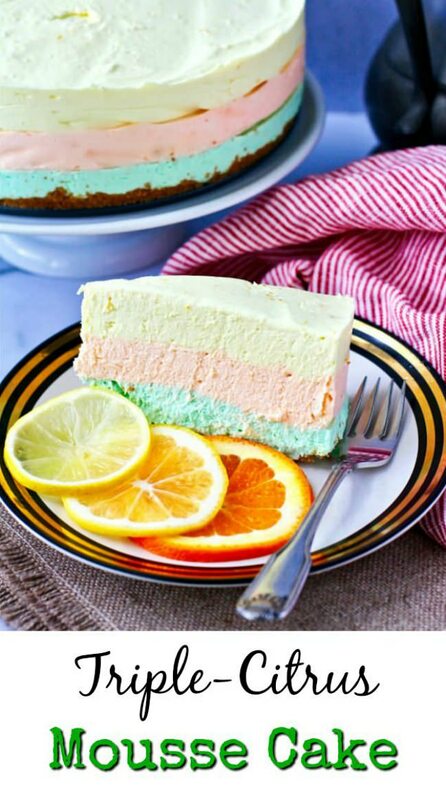 This Triple-Citrus Mousse Cake includes the flavors of limes, lemons, and oranges folded into a delicious mixture of mascarpone, sweetened condensed milk, and whipped cream. 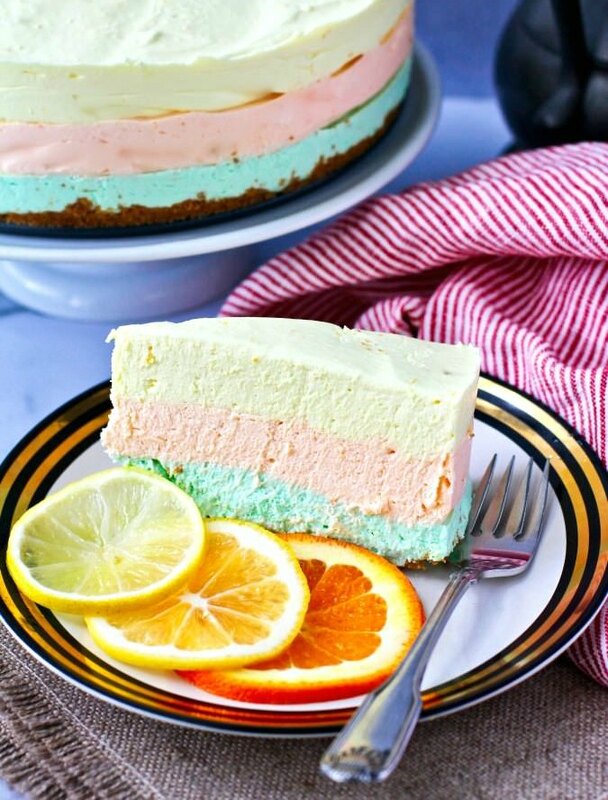 Each of the layers of this triple-citrus mousse cake are flavored with a different citrus flavor, including limoncello, orangecello, and a lime syrup or lime liqueur. 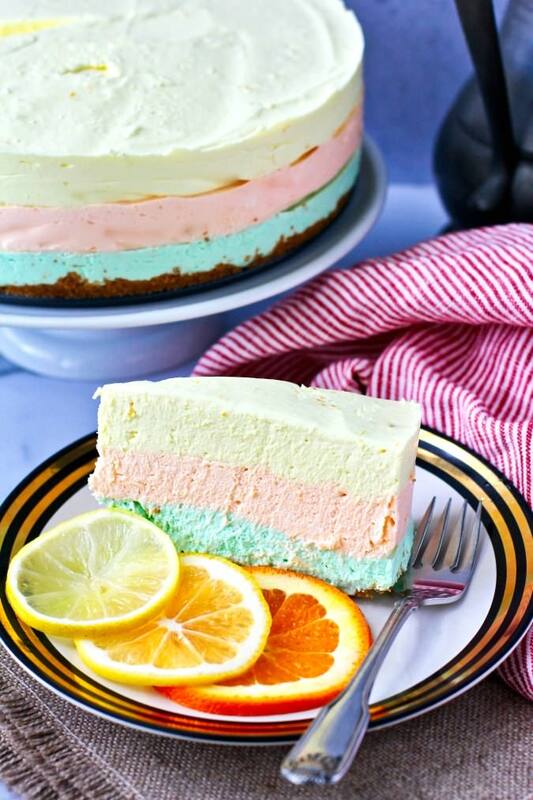 The cake is so creamy and the flavors are so bright. You could almost imagine yourself sitting at a cafe in southern Italy in the summer enjoying a slice. I have been making my own homemade limoncello and tangelocello every year from our bountiful trees. I was really excited to be able to use some of each for lemon and orange layers. The liqueurs only get better with age in the refrigerator. For lime flavoring, I improvised and made a 50/50 mixture of vodka and limeade concentrate, which worked out perfectly. In fact, if you don't want to spring for bottles of "cello," you could do this for the other two layers by using lemonade concentrate and orange juice concentrate. This cake is pretty easy to make. The hardest part is that you have to make each layer separately, which makes for a lot of dishwashing. For each layer, you will need a bowl to mix the mascarpone, sweetened condensed milk, citrus zest, and the liqueur with a mixer. You will also need another bowl to whip the heavy cream. Once you've prepared a layer, you will need to let it chill in the refrigerator for twenty minutes, giving you time to rinse out the bowls to reuse. This cake is from the book, The European Cake Cookbook. The Cake Slice Bakers are spending the year baking through the book. Heat the oven to 350 degrees F. Spray a 9 inch springform pan with spray oil. In a food processor, pulse the graham cracker crumbs with the melted butter until fully mixed. Press the crumbs into the bottom of the springform pan and bake the crust for 10 minutes. Cool in the pan. To make the lime layer, mix the mascarpone, sweetened condensed milk, the zest, and the liqueur in a bowl. Mix with a hand mixer until smooth, about one to two minutes. In a separate bowl, mix the heavy cream with a hand mixer until you have stiff peaks, 3 to 4 minutes. Add the mascarpone mixture and continue to mix for an additional minute. In a small ramekin or custard cup, microwave the water and gelatin for 30 seconds. Pour it into the whipped cream mixture and mix with the mixer until well mixed. Add the optional food coloring. Spread the mixture evenly over the crust and refrigerate the layer for 20 minutes. Repeat with the rest of the layers and refrigerate the final cake for 4 hours. To serve, release from the springform pan and slice. Garnish with lemon, orange, and lime slices. If you are interested in joining The Cake Slice Bakers and baking along with us, please send an email to thecakeslicebakers at gmail dot com for more details. 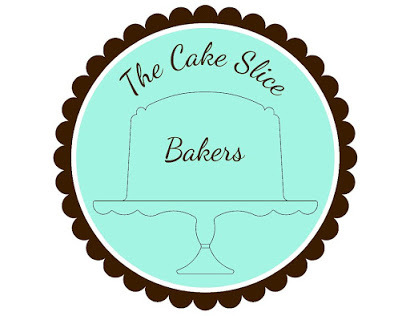 The Cake Slice Bakers also have a new Facebook group called The Cake Slice Bakers and Friends. This group is perfect for those who do not have a blog but want to join in the fun and bake through this book. I love your version...and your homemade tangelo liqueur. Thanks for introducing me to this group. Thanks Cam! The liqueur is a fun project. very very VERY nice, Karen! Thanks so much! I think I need to press down a little more firmly to get rid of the gaps. I'm learning oh cake master! the edges are tricky indeed. I now use the back of a small spoon and kind of "push" the mousse (or whatever creamy layer it is) on the sides, gently, to make sure no air gaps remain. Also, sometimes (depending on the recipe) it is a good idea to stick in the freezer for 20 to 30 minutes instead of fridge, so that the layer that goes on top has a better chance to get nicely leveled. But, tiny gaps or no gaps... tastes equally awesome! I am laughing that you and Cam both chose the same cake to make....of course! Looking forward to joining in the fun next month,. This sounds like a delicious way to use the mascarpone I've been hoarding. Your layers are perfect and thanks for the tips. Your cake looks beautiful! Thank you for the substitution ideas.